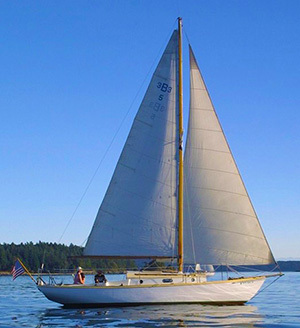 “Aura” is a beautiful 1948 wooden sloop, with a cockpit that will seat six comfortably. A typical San Juan Islands day sailing trip, on AURA with a nice windy day, starts in Deer Harbor on Orcas Island and continues through the Wasp Islands, across San Juan Channel to San Juan Island, back across the Channel and around Jones Island, then through Wasp Passage between Crane and Shaw Islands, into West Sound, then through narrow Pole Pass and back to Deer Harbor. The waters we sail in here are very calm and protected from large waves. Seals are often seen, sometimes porpoises, ospreys and eagles, whales rarely. You can bring whatever you want to eat and drink. 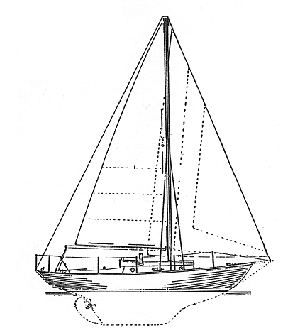 Non-certified sailing instruction is included if you desire. Steering the boat and handling the ropes is a big part of the experience, but if you just want to relax and enjoy the view, you can. We highly recommend you stay overnight at one of the many fine lodgings available on Orcas Island, to give you more time to explore its wonders. The top of Mt. Constitution, an hour’s drive away, is a must-see for the tremendous view. Bring your own food and beverages, whatever you like. Finger food is best. No glass wine glasses, please. The boat has a manual head behind a door. Life jackets are provided. Those under 13 years are required by law to wear them. Skipper may require adults to wear them. You can bring your own. Dress for the weather. Some rain gear is provided. We can put an awning over the boom to keep the rain off us, but we can only use the headsail then. “Aura” is not wheelchair accessible. No dogs, please. Sorry, no overnights on the boat. Day-sails only. 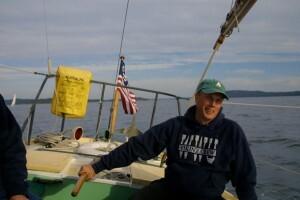 Captain Ward Fay has been skippering professionally since 2001. He is looking forward to sharing his love of sailing with you. To contact Ward for more information, call 360-376-5581, or email wardfay@rockisland.com. No charge for non-certified sailing instruction. With a GROUP tour, there is a chance there will be other passengers on the boat. No more than four people per booking on a group tour. If you wish to book more than four, you can book up to two more on a separate booking on the same trip, or others may book those places. It may be cheaper for you to book a PRIVATE trip for up to six people instead, which costs the same as four adults on a group trip. If you are a party of five including two or three kids, it is cheaper to create two different bookings on the same group trip than to buy a private trip. There is a limit of six total passengers of any age. With a PRIVATE tour, your party will be the only passengers. There is a limit of six passengers of any age or size. such as to Friday Harbor for dinner and back with the sunset, pick-ups and drop-offs at the Orcas Island Ferry Landing, or to Jones Island State Park for hiking or camping. Customized trips take more time. Tidal currents and wind conditions can slow travel times.Trips longer than three hours may be available, for another $50/hour for the boat and skipper. No more than eight hours total. The largest wooden boat racing event of the year in the Northwest. Two races back to back on Saturday, and one race on Sunday. Spectacular photos ops abound in Port Townsend Bay! Racer’s Dinner on Saturday night is extra. 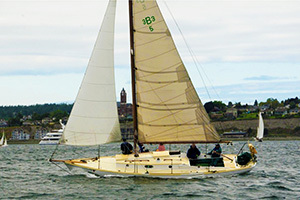 Aura will be doing the six hour crossing of Juan DeFuca Strait on Friday, and back on Monday, weather permitting. $100 per person, maximum four. As Part of the Annual Deer Harbor Wooden Boat Rendezvous. A four hour race aboard Aura through the Wasp Islands, in the company of perhaps a dozen beautiful wooden boats. Sailing experience preferred. $100 per adult. After the Festival all boats go out and mingle. Could be 100 beautiful boats out there. We try to stay out of everybody’s way. $100 per adult.